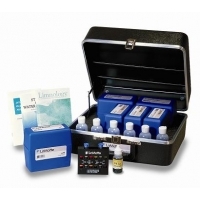 Chemical Test Kits There are 14 products. When the water is too shallow for a secchi disc, turbidity can be measured chemically. 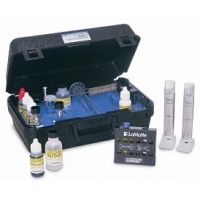 This comprehensive kit also measures temperature, pH and dissolved oxygen. Reagent refill packs are available for purchase. 4120-A30 Total Hardness Titration Test KitThis kit contains acalcium, magnesium and a total hardnessdirect reading titrator. Also contains tablet indicators for 50 tests at 200 ppm. Range is 0 - 200 ppm / 4 ppm CaCO3. Above image may vary. 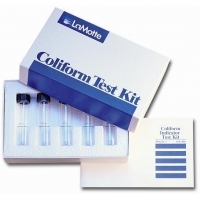 4120-A25 Total Coliform Bacteria Test Kit. 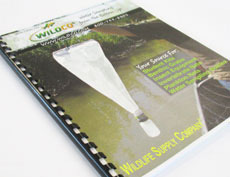 This kit tests for the presence and absence of coliform bacteria. Intended as a screening test only, it is disposable and is meant for one-time use. Above image may vary. 4120-A40 Dissolved Oxygen KitPerfect for AP classes! 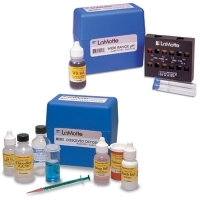 Our direct reading titrator test system has a range of 0 - 10 ppm (parts per million) and a resolution of -.2 ppm O2. Meets EPA guidelines. Enough materials for 50 tests. Above image may vary. 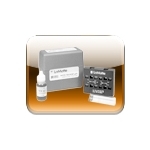 4120-A20 Carbon Dioxide Tests KitThis kit contains a direct reading titrator and enough reagent for 50 tests at 50 ppm. Range is 0 - 50 ppm / 1.0 ppm CO2. Above image may vary.